The role of 'the marketer' is rapidly evolving. So, how does this modern marketing team differ from the traditional one? According to Paul Roetzer, founder and CEO of PR 20/20, “the marketing industry is advancing at an unprecedented rate, creating seemingly insurmountable gaps in the marketing talent, technology and strategy." How does this affect marketers? And what does this mean for the modern marketing team? The role of “the marketer” is rapidly evolving. So, how does this modern marketing team differ from the traditional one? New tools and technologies are changing the way we use marketing to grow our business. The scary fact is that the traditional marketer is becoming obsolete. According to Adknowledge, the majority of CMOs feel unprepared to manage evolving (and key) areas, such as data, social media, proliferation of channels and devices, consumer shifts in behavior, globalization, collaboration and influence. In other words, marketers are not prepared for this paradigm shift and the traditional marketer is facing extinction. In its place comes the modern, digital marketer (or marketing team). Tip: For a more extensive list of skills, take a look at Paul Roetzer’s book The Marketing Performance Blueprint, where email marketing, event planning, mobile strategy, paid media, public relations, video production, and website management are also discussed. The number one skill a modern marketer needs to master is copywriting. As Roetzer notes in his book, “the ability to write persuasive copy for all marketing channels is possibly the most important fundamental modern-marketing skill." In other words, content marketing has become a key business strategy in 2016 and will continue to be so in 2017. Why is content marketing so important then? Due to increasing “marketing clutter," the impact of traditional marketing channels (e.g. magazines, radio, television, billboards) is continuously being diluted. Content marketing can resonate powerfully with your customers, being tailor-made to their needs and interests. It is a vehicle with which you can communicate your brand identity and subject-matter expertise, without being overtly (and sometimes irritatingly) promotional. As reported by one study, 70 percent of consumers prefer to learn about companies through articles instead of advertising. Today’s consumers browse the web in search of valuable information and have built up a certain resistance to the “hard-sell." More specifically, people want to read quality content that helps them make good decisions. Content marketing is also imperative for your website’s SERPs (search engine results pages) and online ranking. Publishing new and original content, as well as updating existing content on your website, will boost your presence on search engines. In turn, more customers will land on your site in their online search for a solution. Modern marketers must have strong analytical skills in order to interpret and implement marketing data. As a marketer, you need to be able to measure the impact of blog posts, social media campaigns and email marketing campaigns. To do so, you need to be skilled in the use of marketing tools, such as marketing automation software, analytics tools, social listening platforms and spreadsheet software. If you know how to interpret the data, you will be able to map out actionable steps to improve your agency’s strategies and drive bottom-line growth. Coding is third on the list of modern marketing skills. I think many of you will agree that “coding” has an intimidating ring to it. Yet coding is the foundation of any website, app or email that goes out to your clients. But don’t worry, you do not have to be an expert programmer to be a good digital marketer. You do, however, need to have a basic understanding of coding, as it will help you comprehend what the technologically limits are when crafting marketing campaigns. By understanding the basics of coding, you can get inspired and create the next innovative campaign. Complementing the fundamental copy is the visual. Telling a story needs to be a combination of both textual and visual creativity. Graphic design skills are critical in a modern marketing team, as this can enhance any piece of written content and increase its shareability. There is no single formula for what makes content go viral, but visual storytelling is definitely part of the equation. As mentioned earlier, SEO strategies are closely related to content marketing. The search landscape has evolved tremendously over the past 10 years, completely changing the way one should go about search engine optimization. The most important thing to know is that SEO is now equally about link building and keyword optimization, as it is about creating content that users love and want to share. Above all, marketers need to hone in on providing value, answering questions and delivering quality content. Hand in hand with modern marketing comes social engagement. Social media is more than a marketing channel dedicated to sharing content, it is crucial in increasing brand awareness, building brand loyalty, bringing in new customers and connecting with current ones. A modern marketer should be capable of recognizing the social media networks most pertinent to their target audience and use these to organically communicate with them. These hybrids, as described in the quote, are the future of the modern marketing agency. 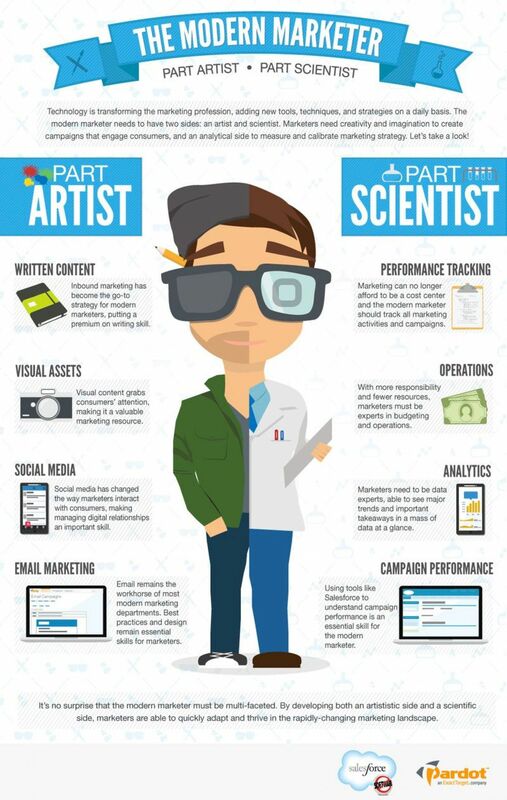 The following infographic depicts the Modern Marketer as part artist, part scientist. This shift has posed quite a strain on firms looking to hire these “marketing unicorns.” While traditionally marketers were hired from the pool of business/marketing/communications graduates, companies should start looking towards building a more diverse team. By hiring people with a background in journalism, media production or English, for example, you can create a team with a diversified skillset. On a more practical note, you can follow Percolate’s three steps for employing your dream team of hybrid marketers (Hint: the key is to train and retrain). The roles and skills outlined in this article are essential to surviving and thriving in modern marketing. If you haven’t done so yet, 2017 is the year to build your marketing team into a digital dream team. As for marketers, now is the time to adopt and evolve so you can stay relevant and reach your maximum potential.